The Appalachian Mountains that divide the eastern part of North America and form the western part of my adopted state of North Carolina, come to an end in Mississippi. It is there, in the Northern Highlands of that state where the southern tip of the deciduous Flatwoods dissect the rich soil of the Black Prairie from the high rolling hills, amid deep densely wooded ravines and rivers of the Red Clay Hills that my great x 3 grandparents, Tom and Sarah Ann Graham, put down roots in 1825, but not for long. Thomas Bradford Graham was from Kershaw District, the first inland settlement in South Carolina, along the spine of the Occaneechi Path, a corridor of Native American trading paths stretching from Virginia to Georgia (passing through Durham, North Carolina where I live) along where the fall line breaks between the rolling hills of the Piedmont and the Low Country. His parents were Scotts-Irish and probably unrelated to the Irish Quakers who followed the road blazed up from Charleston to settle along the Wateree River in Kershaw, after their ship bound for North Carolina was blown off course. He had migrated over the Appalachians with his family led by grandfathers. Both were veterans the War of 1812, one with McWillie’s 2nd Regiment in the South Carolina Militia and the other with the 2nd Brigade, 5th Regiment, 1st Company detached from the 1st Orange County Regiment of the North Carolina Militia. That was when Durham, where I live, was a part of Orange County. When I relocated here from my native Rockies, part of me was obviously coming home, preceded here by my great x 4 grandparents Thomas Bradford and Mary Miller and my great x 5 grandfather David Miller, both of whom were natives of this part of North Carolina. Sarah Ann McCrory was from Tennessee, the daughter of a North Carolina Revolutionary War hero, a veteran of six major engagements. He had also served for a time at Valley Forge as bodyguard to General George Washington and was briefly taken prisoner-of-war near his son-in-law’s birthplace by Tarleton’s Raiders during the Battle of Camden. The old soldiers were now stranded across the Alabama line from the young couple. Tom and Sarah Graham’s new home place near DeKalb was midway between the relatively new settlement of Tuscaloosa and the newly-created town of Jackson, up the ridgeline-trace from Natchez to make the state capital more centrally located. The land had been recently ceded by the Choctaw Nation. Eight years before my newlywed ancestors settled there, Mississippi had become a state following the lopping-off of Alabama. As they settled into their new home, Colonel Davy Crockett had just survived the sinking of his flatboat,across state, on the Mississippi River and was readying his first run for Congress. Crockett died at the Alamo in 1836, a few years after legends began to evolve such as the one that he - “Kilt him a b'ar when he was only 3.” But within a decade my ancestors left Mississippi for the Rocky Mountains where my great x 3 grandfather’s true story does involve a bear, but a mammoth Grizzly Bear. The party which included Tom’s parents and my then three-year-old great-great grandmother Amanda probably crossed Mississippi to the river on the wagon route that is now route 16 or possibly across what became Old Route 80 and is now Interstate 20. Either way, they would have caught a paddle-steamer up the Mississippi River from Vicksburg or two or three other ports. They possibly rode the sleek, 60-ton, light draft Maid of Iowa. It specialized in carrying passengers and cargo past the De Moines rapids to a settlement where Mormon converts were gathering at the time at that part of Illinois across from the little jag where Iowa cuts off a corner of Missouri. There my ancestors joined one of several trains of wagons heading up the Des Moines River on what was to be the first leg of a 1,400-mile journey west into the Rockies. The Grahams only made it 36 miles upriver before forced to winter over near Farmington, Iowa where I stopped along a cross-country trip last year. Tom’s wife Sarah Ann and other relatives died there. He stayed two years and then he and little Amanda and her brothers and sisters continued west. As they crossed the Missouri in 1852 near Council Bluffs, they hooked on with a train of 64 wagons and a few hundred others headed west along a route blazed five years earlier by four other of my ancestors. Tom often carried Amanda on his back as he walked beside their wagon, which by then had switched from horses to oxen, because her feet were bleeding. They arrived in the valley of the Great Salt Lake in September and settled near along the Rockies at the mouth of Mill Creek Canyon, but again they didn’t stay long. In 1859, Tom and by then 15-year-old Amanda headed 80 miles further north up into Cache Valley, among the first to settle Fort Mendon snug against the towering Wellsville Mountains. Located at what was then the best entrance to the valley from near the border with Idaho, Mendon is the oldest continuously inhabited settlement in the valley. 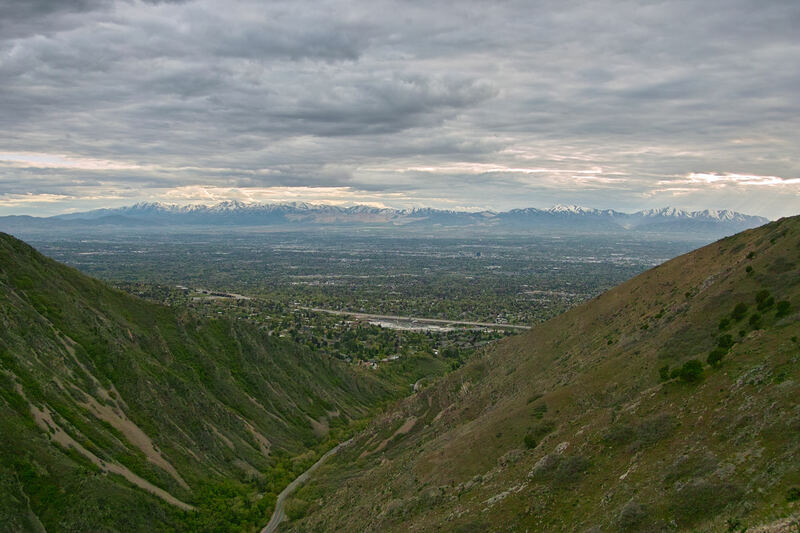 Nine miles east, on the other side of the valley, tight against the Bear River Mountains lies slightly younger Logan, home of Utah State University, where my lawyer-daughter first attended college. On a cross-country trip in 2011, I crossed the valley at this point on scenic route 30 as I traveled between the Pacific Northwest to connect with I-80 East in Wyoming. Route 30 highway crosses the “Big Slough” of the Little Bear River just northwest of what would have been Fort Mendon and 20 miles south of where, two years later, my “Bowman” ancestors would settle Richmond and then Hyde Park. The “Big Slough” holds significance. My great x 3 grandfather, Tom Graham, left the fort in search of firewood there one day in the fall of 1864. He was with young A.P. Shumway, Amanda’s husband, when he was, as is well documented by several researchers and authors, attacked and killed by a giant grizzly bear who was itself then hunted and killed. While A.P. was bringing around the horse-drawn wagon, Tom had exchanged his rifle for an ax and while wading into some willows had stumbled on to the very entrance to the grizzly’s den. If he saw it coming, Tom’s last view nay have been of a 12 inch long, 8 inch wide paw with huge protruding claws. 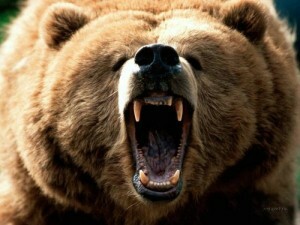 A grizzly stands about 6 foot tall and three feet wide and even at 700 lbs. can run 30 miles per hour. Even though he was reportedly renowned as a bear hunter, he had appeared unarmed where they would be their most fierce and protective. He would tease folks by taking a rattlesnake by the neck and spitting tobacco juice in its mouth to kill it. Much like my uncle Louis Davis did from the bumper of his pickup when I was young, Tom could sit eight feet from the door of his log cabin and spit tobacco juice through the latch hole. As has been true in my family for at least six generations, he was also very good with horses. None of these feats were a match for a grizzly and Tom’s body was taken back to Salt Lake City for burial. In my family, we grew up with an appreciation for grizzlies. Grizzly Bear population declined from 100,000 across North America when Europeans arrived to less than 50,000 when my great x 3 grandfather’s remarkable life came to an end after spanning 2,500 miles of the continent. The Grizzly population was near extinction by the 1970s when I was in college and became a protected species because of the unique role these bears play in stimulating ecosystem services. Now through protection, Grizzlies have been coaxed back to 700, nearly all in the Greater Yellowstone Ecosystem where I was born and the conservation challenge is the threat to their food sources and how to limit conflict with humans. Now in recovery, one of the areas where grizzlies most like to range is again from Yellowstone across into my native Fremont County, Idaho, two hundred miles north of where my great x3 grandfather had that fateful encounter along what I often term the fault line of my youth. They are drawn across the Targhee by the migration pattern of the 2,000-strong Sand Creek elk herd as it moves back and forth passing near our ancestral ranch traveling from winter feeding grounds along the creek to their home in the Park in spring, summer and fall. Since the 1880s, this nook of Idaho has been known grizzlies, drawn even more by the distinctive Yellowstone Cutthroat Trout native to the Henry’s Fork River as they are to elk, deer and moose there. Another 50,000 Grizzlies across Alaska and northwest Canada, 30,000 alone in Alaska where I lived in the 1980s. I have a feeling that despite his unfortunate encounter, Thomas Bradford Graham would be impressed as I bet will be my grandsons, his great x 5.